polish fixation: Sprouse it up! Hey guys! Today I have a really fun mani to show you! It features a polish called Sprouse by Candeo Colors. Candeo is an awesome indie brand that has recently become very popular! Which is not a surprise due to the amazing polishes she comes up with! 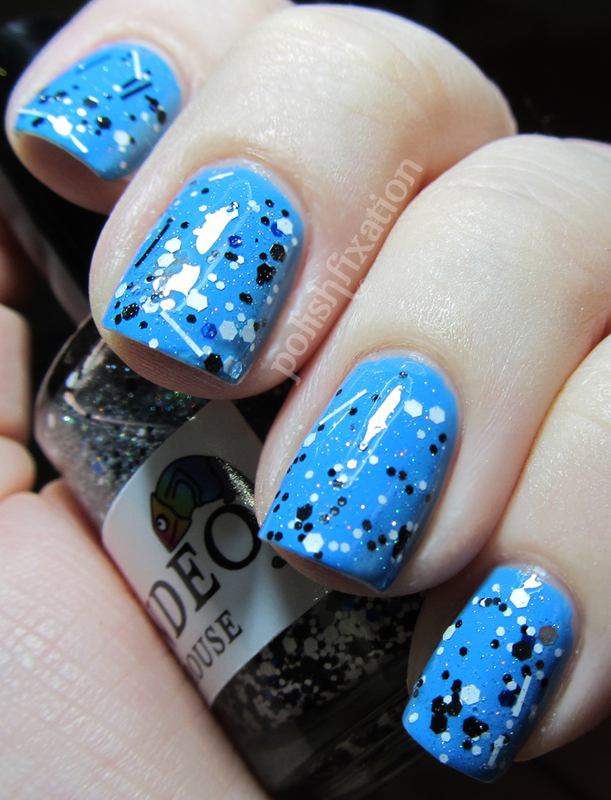 The base color in this mani is GOSH Blue Balloon. Then I just topped with a coat of Sprouse. I love that this polish has some random blue glitters and also that the micro glitter is holographic glitter. It is hard to tell from the photos but if you look at the first photo you can see how the micro glitters shine. I need more Candeo Colors in my life soon! Have you tried any polishes by Candeo? in L O V E.....i need this in my life! I love this combo! That Blue Balloon is so vibrant! I want Blue Balloon! It's gorgeous! Love the black and white glitter too but I have so many at this point that I can't justify another! I love Candeo!! This mani is gorgeous!! This is great. I love how it looks almost like paint splatters. This reminds me of that Lynderella polish -Sticks and Stones I think it's called that no one can get hold of - in fact no one can get hold of any Lynderella's for the most part - nothing at all against Leah Ann who is wonderful - just too much demand for the Lynderella line. This would be a great sub for that and just is a wonderfully fun topper light glitter that appeals to most everyone!